Heat coals or gas grill for direct heat. Cut 18x18-inch piece of heavy-duty foil; spray with cooking spray. 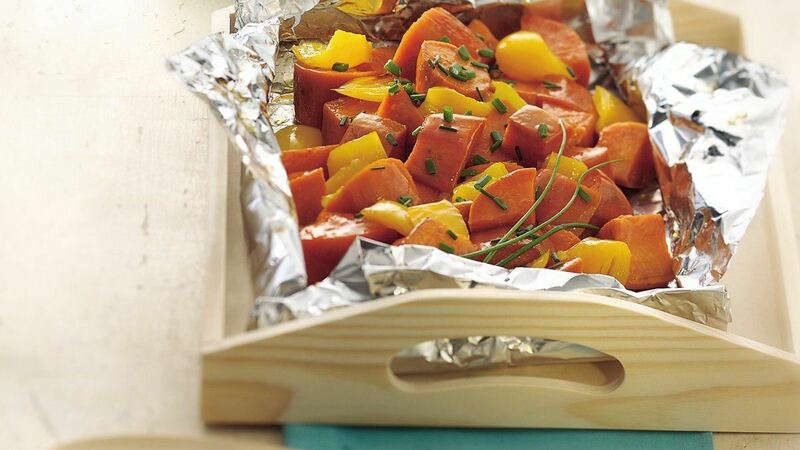 Place sweet potatoes and bell pepper on centre of foil. Mix butter, honey and seasoned salt in small bowl. Drizzle over potato mixture; stir to mix. Fold foil over vegetables so edges meet. Seal edges, making tight 1/2-inch fold; fold again. Allow space on sides for circulation and expansion. Cover and grill packet over medium heat 15 to 20 minutes or until sweet potatoes are tender. Place packet on serving platter. Cut large X across top of packet; unfold foil. Sprinkle with chives. Success: For the best flavour, buy sweet potatoes that are dark orange in colour. Because they don't store well, keep them in a cool, dry, dark place for up to one week. They should not be refrigerated. Success: For easy preparation, make these sweet potatoes in a disposable foil pan. Just cover with foil, then grill according to the recipe.